TikiMaster Hawaiian Octopus Tako''HE'E'' - Hand Carved 10'' | #non0520 by TikiMaster at Home Decor Outlet Store. MPN: NON0520. Hurry! Limited time offer. Offer valid only while supplies last. Here is a beautiful hand carved Hawaiian octopus also known as he'e hand carved out of monkey pod and hand rubbed to give a beautiful finish. Here is a beautiful hand carved Hawaiian octopus also known as he'e hand carved out of monkey pod and hand rubbed to give a beautiful finish. 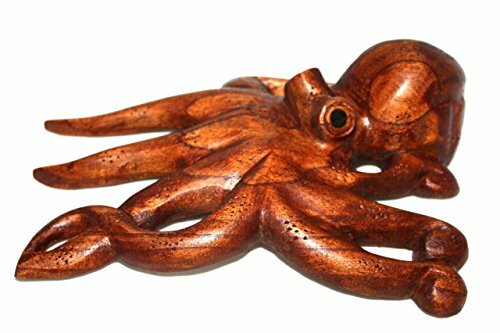 Specifications: Octopus also known in Hawaiian as Tako or He'e Wood: stained monkey pod Size: 10" X 6" Desktop use or can be hung on the wall Great gift idea! View More In Nursery Keepsakes.